Place Your Order for Organic Produce Online! Throughout the Summer/Autumn growing season we deliver weekly around our region, with regular days set aside to the differing localities. Most people take advantage of this, but some prefer to visit us and we welcome your visit to our packing shed. Fruit only boxes, mixed or bulk, are available throughout Dec./Jan. All produce is available in 5 - 6kg trays or 8 - 12kg boxes. The weights per box quoted are a minimum, sometimes there is extra! The price range is a $35 minimum order through to a $60 box. It is for to you select the weight/price ratio that best suits you. Individualised $35/ 5+kg Trays ready for delivery. The produce listed below is everything we grow over the course of the year, meaning some fruits and vegtables will not be available for your box that week. Eatting seasonally however means you have a Nutrition-rich diet, eatting a varity of produce. Growing seasonally for us and our customers means we are working with nature to give you the most nutrious, chemical free produce with minium food-miles and less waste. If you would like extra fresh produce, like tomatoes, to put away for the winter months, we may be able to offer a reduced price during peak harvest periods. It is up to you to educate us to your particular needs. The order form below may be used by new/interested customers or current regulars who may wish to adjust their personalised boxes. Travellers who are visiting the region may also use it to arrange a pick up. How it works is quite simple. 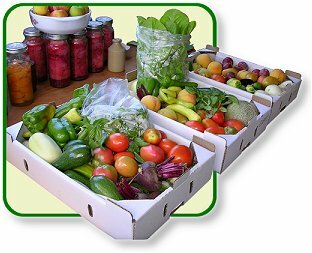 You simply indicate what you don't like (or you may have it already growing in your own garden), then your box will be packed with a share of whatever is harvested, less those items.